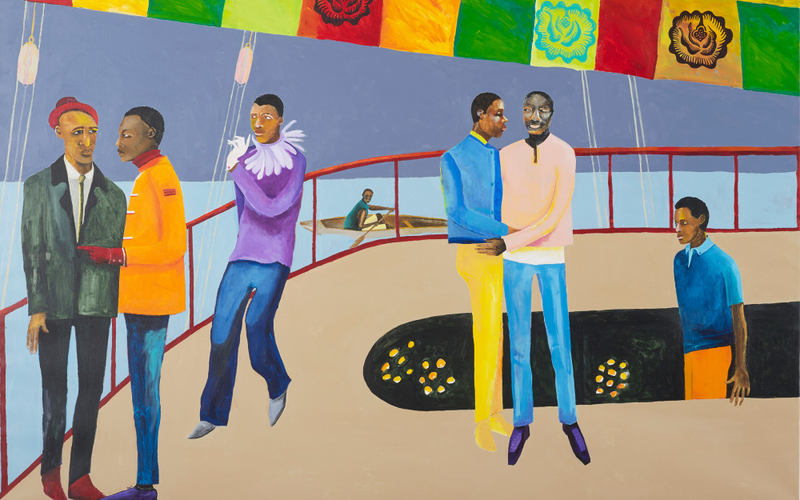 Ball on Shipboard, 2018 Lubaina Himid. Image courtesy the artist and Hollybush Gardens. Her work will also be presented by Hollybush Gardens during Art Basel. Dr Zoe Whitley, curator, International Art, at Tate Modern, spoke to the Turner Prize 2017 winner about black visibility, historical trauma, and the power of the ordinary in her paintings. Read the interview on Art Basel website. Occitanie / Pyrénées-Méditerranée (Sérignan, France) until 16 Sept and Our Kisses are Petals at Baltic (Gateshead, UK) until 28 October 2018. She is also one of the exhibiting artists of Not a Single Story at Nirox Sculpture Park, Krugersdorp, South Africa) until 29 July and A Woman’s Place, Knole House (Kent, UK) until 4 November 2018. Featured image: Lubaina Himid, Ball on Shipboard, 2018. Courtesy the artist and Hollybush Gardens.